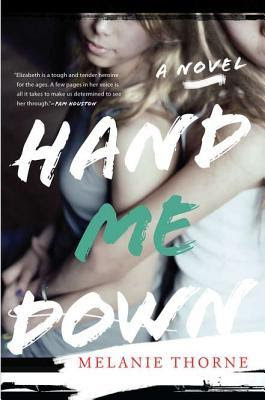 Hand Me Down [Audiobook Review] – my books. my life. When 14-year-old Elizabeth’s stepfather gets out of prison, and he is prohibited from residing in the same house as children, Elizabeth’s mother is given a choice. She chooses her husband, and Elizabeth is left alone, passed around to relatives and friends, trying to find a home. I have once again waited much too long to write this review to do it justice (sorry, Melanie). I can tell you that I liked this book a lot. It was painful to read at times and I’m not sure I can say I “enjoyed” it, but it is very good. I wanted to slap all of the adults in the novel. When it’s a choice between your children or anything, you choose your children. Period. And when it’s a choice between your children and some sleazebag husband who just got out of prison, you absolutely choose your children. Go read Jen’s review, since mine is a bit incomplete. She’s the one who recommended Hand Me Down to me. Ali Ahn did an excellent job with Elizabeth. She doesn’t sound too young (which can be extremely annoying in audio) but she captures her voice perfectly. I also thought she got the mother’s voice spot on. As Jen mentions in her review, there were some weird pauses that would take me out of the story sometimes. Not sure what happened in production there, but it’s still worth listening to. Those pauses were so weird. I was still glad I listened since Ahn did such a good job, but yeah.